Big squidgy balls of sweet, gooey goodness. What is there not to like about mochi? While I wouldn’t pretend to know the first thing about how to make the wobbly buggers, they’re something I always try to pick up from Asian stores when I see them. And nowhere stocks a range (in my very limited experience) like the Japan Centre. Black sesame, green tea, pink strawberry and plain white. Brightly coloured, neatly wrapped bubbles of fun waiting to catch your eye as you cruise on by. A mochi looks something like a large squishy pebble. It’s a glutinous, thick and elastic rice wrapper, sometimes flavoured with something like green tea or rolled in sesame seeds, containing a filling of some sort. Often sweetened red bean paste, or maybe a whole strawberry. Trying to grip a mochi is like holding a kitten that doesn’t want to stay still, it keeps slipping through your fingers. The joy is all about the contrasts of taste, texture and colour, and the fun of actually eating the slippery thing. The red bean paste itself is definitely an acquired taste, but well worth acquiring. It’s gently sweet and earthy, like red ambrosial soil. The wrapper’s elastic and slightly chewy and clings to your teeth in a deliciously glutinous way. Eating it feels decadent, like slurping down a live oyster. And as you take your first bite, it sags in the middle, sending you a wide red knowing grin as the wrapper stretches and the paste starts to slip through your fingers. Did I mention how much I love them. And they’re only £1.20 each. Bargain. I love red bean paste. One of my favourites are jing dao (I can’t remember how to spell it but that’s my approximate pronunciation which usually works in communicating what I want). The hollow sesame studded chewy spheres with a red bean paste pellet inside! I fear I’m turning into my Dad by proclaiming everything originates in China and that the Chinese version is better! 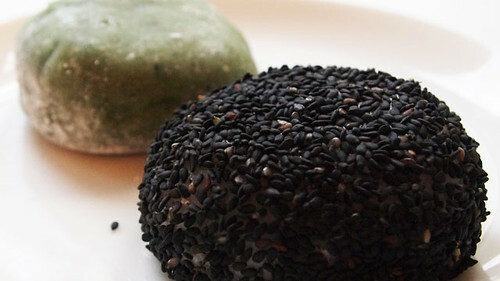 Anyway I’d be interested in what you think of the dim sum relative of mochi, black sesame balls. BTW – did you spot the udon restaurant, Toku, next door to the Japan Centre? I’ve not been but it’s on my list. Toku used to be my regular. I revisited with Jen a while back and it was solid filling stuff. But back to mochi – I could really do with one right now! @Kavey – me too, it just took a while to get used to. I like those sesame balls too! @Mr Noodles – so long as you don;t start with ‘back in my day…’ you should be fine I’ve never tried the Dim Sum equivalent, so they’re next on the hit list. @Tom (&Mr Noodles) – i didn’t notice Toku, I had eyes only for the mochi (and the fish balls). Will keep those globes peeled on my next visit though, and will peruse the menu. Mochi are on my list, ever since I saw a croquembouche made of mini mochi balls!!!!!!! @Kitchen Butterfly – oh, that sounds lovely (although i did have to google ‘croquembouche’). Did they not all stick together though? @catty – they do icecream mochi. Oooooo. And now I want to go to Tsuru too. Anywhere that does a good mochi has my vote (not sure what for – primeminister? mochi mayor?). LOVE mochi. Have you seen the kits you can buy to make it at home. Alas, they specify a microwave (which I don’t have) but I wonder if there’s a good substitute – steaming? @Su-Lin – you can get mochi making kits *leaves computer and dashes for the door* – i am so getting one of those. They sound great. And finally, a use for the microwave that has sat unused and unloved in our kitchen since we moved in 2 years ago. The only mochi I see regularly are the ones in packs of six or so in the Chinese supermarket.. can you get bigger ones? Incidentally, my partner is completely addicted to the chocolate mochi that you can get in Yo!Sushi. To be honest, they’re pretty good. @howardbites Hi. If you’re in London or somewhere similar you can find them in most Asian grocers. Or check the Japan Centre online store. You’re the second person to mention the chocolate mochi, i’ll have to give it a try. There’s loads of asian grocers on mill road in cambridge that stock mochi, i was so pleased when i found them! You can get packs of little ones, or larger ones, and they’re generally green tea or red bean. I prefer the red bean ones though. @MeliaRuby – yeah, the red bean ones are my favourites too. I found the filling was an acquired taste, but once acquired, it has never gone away. So gently sweet with a lovely texture.